You've been to plenty of ugly Christmas sweater parties in the past but have you ever been to a Halloween sweater spooky soiree? Don't worry if you haven't received an invite yet! It's a new trend that's just starting to take off and we're here to make sure you're prepared once the time comes to RSVP. 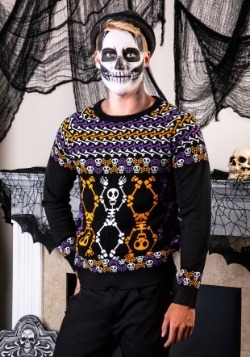 Our line of Halloween sweaters are a Made by Us product, meaning they're high-quality and expertly designed. They're perfect to wear the whole month of October, ideal for attending spooky soirees, and can even be used to construct your very own, one-of-a-kind costume. Since we're pioneers of the Halloween sweater fad, we completely understand how to create a perfect sweater. First of all, of our ugly Halloween sweaters are made in unisex sizes so they fit both men and women perfectly. Keep this in mind when you're selecting your size. Second of all, these are all Made by Us designs which means they're expertly crafted with care and made from high-quality materials. Don't expect any of these sweaters to unravel or get holes in them after wearing it a couple times. Also, they're not itchy either! We would never try outfitting you in an itchy sweater. What a mean Halloween prank. 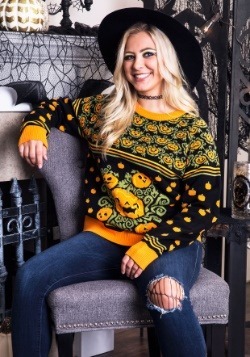 If you're someone who loves the appearance of a classic Fair Isle print and classic horror movie monsters, then we have the perfect Halloween sweater for you. Extremely colorful and featuring images of vampires, Frankenstein's monsters, witches and pumpkins, this piece of apparel is great to wear to a vintage Halloween party. Pair it with a pair of jeans or a skirt for maximum style. 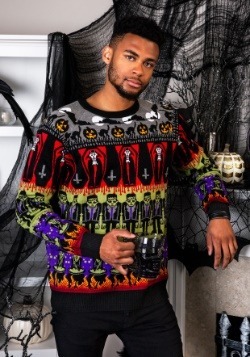 Fans of this sweater will also love the Day of the Dead dancing skeletons sweater as well as the Dracula Halloween sweater because they feature colorful prints and eerie monsters too. Those with a high-fashion approach to their sense of style will love sporting the Spellcraft and Curios Halloween sweater. A perfect combination of witchy and trendy, this monochrome sweater is knitted from 12-gauge yarn and features images of witch hats, potion bottles, phases of the moon and a large black cat on the back. This is a great Halloween sweater to turn into a unique costume. Pair the Curios sweater with a pair of fishnet tights, black heels, and a pointed hat to construct your very own stylish witch costume, perfect to wear to a Halloween work party or when taking the kids trick-or-treating. If you're drawn to this Halloween sweatshirt for women, the black and white skeleton Halloween sweater is another viable option. 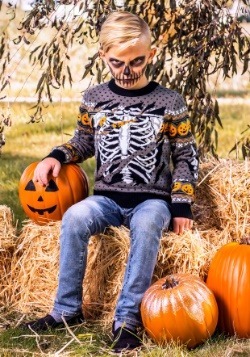 Not only do we have adult sweaters but we have Halloween sweaters for children too. They're great to wear to school functions and parties. Dress the whole family in Made by Us sweaters and take a picture in front of a spooky backdrop. Let us know how much you like these sweaters by leaving a product review. We love hearing from you so we can bring you more Made by Us apparel that you love!